This past weekend my husband Matt and I celebrated our 13th wedding anniversary. For a gift, I wanted to make him something meaningful and got the idea to use city maps from an old atlas to mark landmark moments in our relationship. I found an Umbra frame with three openings that looked perfect for the project. The only other supplies I needed were photos of us from the old days, a pencil, ruler, scissors, and a black Sharpie — things we already had around the house. 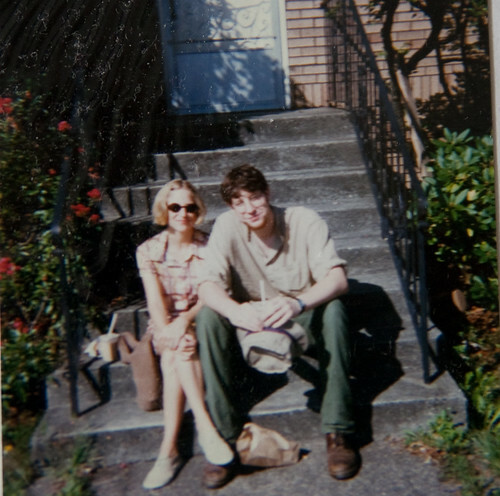 Our story starts in Seattle, where we met through a mutual friend in the “music scene” way back in 1995 and started dating soon after. Here we are about to go to the famous Seattle music festival, Bumbershoot. 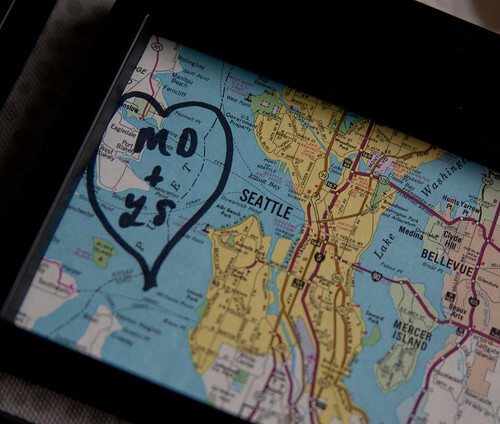 So, for Seattle, I wrote our initials (LS from my maiden name + MD) in a heart. Our story continues a few years later, in 2000, in Chicago, where we got married on March 17 at the justice of the peace at Daley plaza. We were on a road trip to move together to D.C. and decided to elope along the way. Since a good friend Heather lived in Chicago, we stopped there to do the deed. Turns out, you do need to wait 24 hours after registering at the courthouse (just to be sure, I suppose). Unlike Katie who celebrates St. Patrick’s Day every year, our families don’t really observe the holiday, in spite of the smidgen of Irish on my paternal Grandmother’s side. We only realized that our wedding day fell on St. Patrick’s Day when a tipsy couple wearing matching green sweat suits came into the courtroom hoping to marry on the spot. I still wonder to this day if they came back after the mandatory 24-hour waiting period. After a round-about journey to D.C. for a year, and then back to Seattle, where we had our first daughter Ana in 2003, we finally settled down in Alexandria, VA to be close to D.C. where Matt works and near our parents. We had our second daughter Nadja here in 2008. Alexandria, VA gets a star on the map. I hung the frame on the wall of our bedroom next to a photo Matt’s brother took of Ana and me, five months pregnant with Nadja. I meant to surprise him with it when he came home from a business trip the night before our anniversary. Here it is close-up. I like that the informality of my handwriting but also the top-down chronology. There are other ways to do this with handcut mat openings in the shape of hearts, for example, or with hand-stiching on a map. 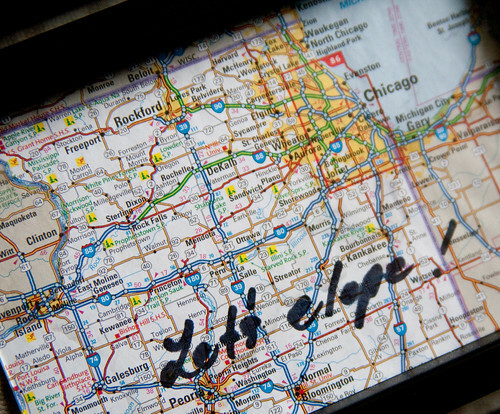 All, I think, wonderful ways to work with maps to make a gift for a special someone. I’m sure this won’t be my or Katie’s last project involving maps either. We can’t seem to get enough of them! 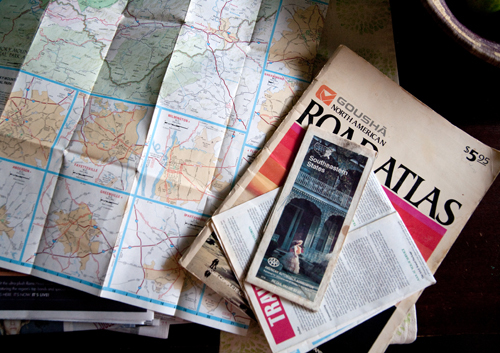 So far, we’ve used maps to make a handwoven basket, coasters, and a frame as a vacation souvenir. Have you made anything fun with old maps? What a creative use of maps! I’m from India and at a flea market many years ago I found an antique dealer selling maps of India from a Johnson atlas from 1865. That was when the British ruled India and the names of the cities and towns had a very definite anglicized tone to them. Naturally I bought the map! On one of my subsequent visits to India, I bought photos of various maharajas of little kingdoms in India from that period. 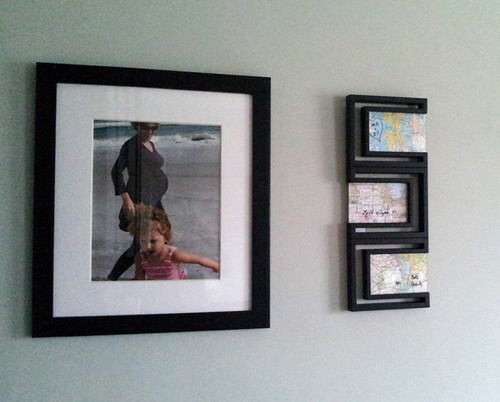 I hung the framed map of India and the period photos together to create a “little India” corner in my family room. That sounds so cool, Vineeta. We’d love to meet you and see your corner! That would be lovely. Please ping me offline and we can talk about getting together. Lovely gift and fun story. Congratulations on 13 years! Well done. Congratulations Leslie and Matt! Great gift!